Hey all you people who just finished marching this summer! We're running out of Forzato pics! Hurry up and e-mail your best shots from the summer to dave@dci.org along with where and when the photo was taken. Send some biographical information about yourself as well. We'll give you full credit. Also, let us know if you want your e-mail address included. 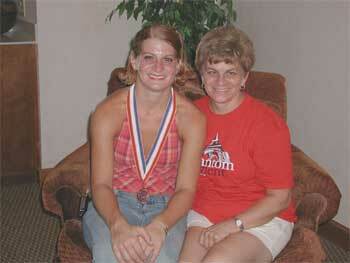 Patty Souder sent in this pic of Rebecca (Phantom Regiment guard) and her mom, Mary Ann, both of Michigan. "My husband and I, along with four friends, met Mary Ann at our hotel on Thursday and she told us about her daughter Rebecca, and that this was her ageout season. Not having a marching member to cheer for this season, we decided that Rebecca was our girl, and urged all those sitting around us at each show to cheer with us. "Each morning Mary Ann would tell us that she enjoyed hearing us yell out her name. After finals we knew they would both be coming back to the hotel, so Bill, Steve and I waiting in the lobby and provided her with an ovation around 3 a.m. Even after a long emotional day, she was so very sweet to visit with us for about 20 minutes and I had the chance to take this picture of her and mom." Thanks Patty!